Although High Unite claims that the ads are necessary to make the program free of charge, it sounds rather ridiculous because its primary function is to display commercial advertisements. An enormous amount of ads will not only annoy you, but it might cause damage to your computer too. Obviously, the program will never have any useful features as it is yet another clone of similar older adware programs such as Discovery App, High Stairs, Wander Burst, etc. and in the future, there will be even more of them. 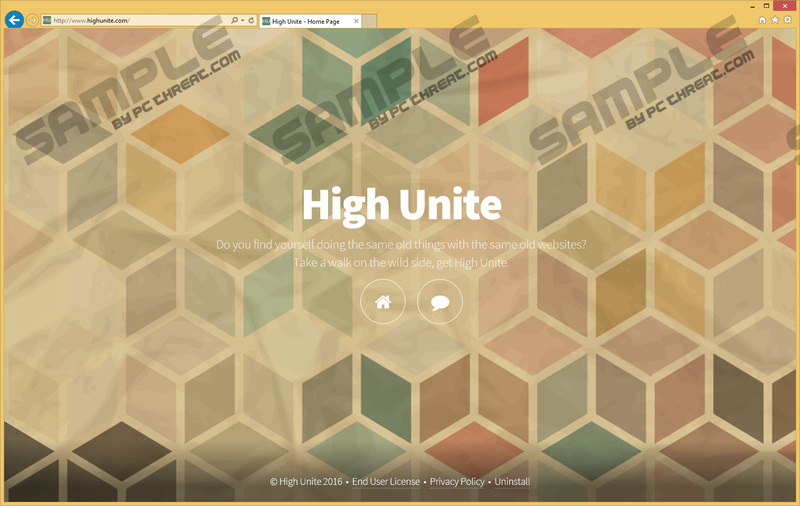 Therefore, read the article to learn more about High Unite and adware in general. Also, it would be better to delete this worthless application, for that reason we will provide you with the removal instructions below the article. If you have Google Chrome installed in your system, then you should have already noticed that the adware does not work on this browser as it is compatible only with Internet Explorer and Mozilla Firefox. The program itself does not have any separate window, because it settles as a browser extension. Therefore, you will see High Unite’s name only on the ads it displays. Unfortunately, you might have installed this adware without realizing it as many other users did. The application can spread though bundled downloads, meaning it could be installed with another software at the same time. Usually, such setup wizards are made in a way that it is hard to notice these other programs, especially if you rush through the installation steps. Furthermore, as you browse you will see numerous pop-ups, full-screen windows, modified search results with sponsored links, etc. Mainly, they will promote third party websites or products. While clicking on such content you might be redirected to harmful websites that could try to gather your sensitive information, sell fake software or infect your computer with malware. Also, the adware will gather information related to your visited websites, clicked ads, bought items, and so on. However, it could collect your private information too with a condition you provide it yourself. Although you might think it is impossible, we know a few ways it can be done. For instance, contacting High Unite requires your personal information like your name, email, etc. and that would be considered as data you give away willingly. Moreover, you can reveal your sensitive information while buying items online on a third party website, because they can collect your data either with the knowledge of High Unite or not, as third party websites have their own Privacy Policies. The sensitive information could contain your credit card passwords, so third party could record it while you are purchasing items from their fake e-shop and use it to login in your bank account and steal money from inside. Therefore, it is always safer to avoid suspicious ads and buy items from a well-known seller you can trust. All things considered, High Unite does not seem like a trustworthy software or a useful tool that you would like to keep in your system. As you realize there are many possible harmful effects and it is only a matter of time till something goes wrong. It would be advisable to get rid of it as fast as you can and to scan your computer if you have visited any third party websites while High Unite was installed. You can delete this adware via Control Panel, but since the application affects Internet Explorer and Mozilla Firefox, you will have to manually erase its created extensions from these browsers too. If you need any help with the removal you can take a look at our instructions below. Press Windows Key+R and launch the RUN dialog box. Type Control Panel and press OK.
Find the adware and click Uninstall. Pick the program and click Uninstall. Find the unwanted application and select Uninstall. Select Manage add-ons and choose Toolbars and extensions. Delete High Unite folders from them. Quick & tested solution for High Unite removal.